Domestic and sexual violence has never in my memory received so much media attention, with waves of recognition such as the #metoo campaign which triggered many women and men in Hollywood –as well as women in politics on both sides of the Atlantic – to come forward and confront perpetrators of historic sexual abuse. It’s fantastic that some victims of sexual abuse are coming forward and speaking out about these traumas and the horrific crimes against them and I very much hope that it encourages more victims to have the courage to confront their abusers. Disclosing abuse is an act of immense bravery, but sadly, the price many women pay for revealing and exposing sexual harassment is, unacceptably, further harassment and abuse. It’s clear that we still have some way to go. The march organised by domestic abuse charity RISE in Brighton was a vital opportunity to make some noise on an issue over which many people find themselves utterly silenced. One in four women experience domestic or sexual abuse in their lifetimes. This seems to be an entrenched societal problem yet there aren’t enough people talking about it seriously, and even though more people are now coming forward, the Brighton and Hove City Council has recently admitted that support services cannot keep up with the increase in demand. We know that the festive season is particularly concerning because it is a period of time when more domestic and sexual violence takes place. We don’t want to see victims left without the support that they need. That’s why we are asking the council to urgently look again at their budget and to find extra money to put into the services that support these victims. They cannot and should not be left alone. Violence and sexual abuse is a reality some of us find hard to talk about – meaning it is all too often pushed aside. Violence and sexual assault disproportionately affects more woman and girls than it does men and boys, though both are equally as awful as each other. 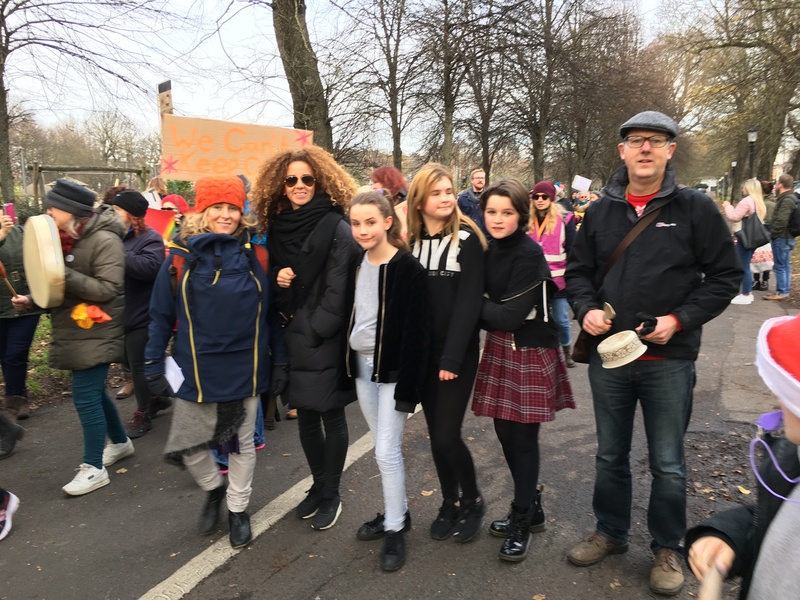 I attended a march on Saturday 10th December 2017 for RISE, an amazing charity in Brighton and Hove that supports people affected by domestic abuse. They were ending their 16 days of activism to raise awareness of people who are affected by this awful debilitating abuse. It was a moving – and necessary – event. There are other charities out there that help support survivors of domestic abuse and sexual violence too, such as the Survivors Network, Brighton Women’s Centre, rapecrisis.org.uk and the Oasis project. But as cash injections and resources to many Council funded services, including refuges, continue to dwindle, each of these organisations become a greater lifeline for people needing their support – but also find themselves ever more stretched. In Brighton and Hove recent figures show that up to 7,639 women and girls are estimated to have experienced sexual assault. There were 4,703 domestic violence and 821 sexual offences reported to the police in 2016/17, an increase of 28% – and 115% respectively since 2013/14. However police recorded data is likely to be under represented. Behind every statistic is a person carrying the pain of abuse– and behind those statistics will be more women and girls who are unable to speak out. As we face up to the problem we must also take the bold steps that are needed to prevent sexual violence, discrimination and abuse. Feelings of shame, guilt, blame and fear of the consequences of speaking out become tools used by perpetrators to keep abuse hidden. The reality too is that many of those who also find their voices unheard in other aspects of public life, such as people who are disabled, can find themselves doubly hidden when it comes to being able to speak out about abuse. As recent campaigns have shown, women and girls are not only hesitant to speak out but also have to fight to be heard. People with disabilities already have to face up to disability discrimination in public life. It’s so important not to lose sight of the fact that those who are already in a vulnerable place can find their struggles against discrimination exacerbated when compounded by sexual violence and abuse. For anyone dealing with these traumas, there are long term issues, which people will face on top of the challenges and disadvantage they already encounter. Without additional funding for domestic violence services, prevention work, charities and refuges, Councils and Government cannot be said to be taking the issue seriously. Lip service is not enough to support the needs of those who want to come forward, or to provide services for those who do.